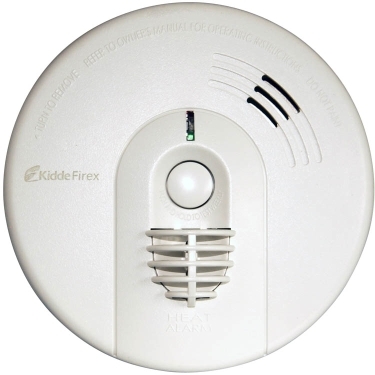 Kidde's Firex range are hardwired smoke and heat alarms which have a 6 year guarantee and are BSI kitemarked therefore ensuring that level of quality would be consistent as it provided by the world's largest manufacturer. Ionisation and optical models have proven to be exceptional alongside heat alarms for situations which would prove to be unsuitable for smoke alarms such as kitchens and garages. Both models are mains powered with a built in back-up power, thereby complying with a given set of instructions and minimum requirements for the relevant building regulations for new housing i.e. Grade D (BS5839, Part 6). These models are particularly used in humid or dusty environments wherein smoke alarms fail to operate satisfactorily. For example kitchens, boiler rooms, unconverted garages. They are triggered immediately when the ambient temperature reach 57 degC and must always be interconnected with smoke alarms from the same product range.